In a world with so much stuff, from phones and chargers to cameras and even the dog, it's hard to keep tabs on all of your valuables. There are hurried cab rides, and so-called friends and family who like to "borrow" your stuff without asking, only to have said stuff go missing. Or maybe you're the forgetful type who's prone to "misplacing" your keys and wallet. Whatever the case, you have no idea where it might be, you need it now and you can't find it. Thankfully there are a slew of devices that can help to locate your lost items. These small gadgets and apps work by affixing a GPS-like tracker to objects like laptops, handbags and bikes, which makes it easy to find them if you ever lose track of where they are. We've rounded up seven great tracking gadgets with alternative options to help you monitor your essentials and prevent you from actually losing your mind. You can't get back all of those lost keys, wallets and remote controllers that have mysteriously vanished over the years, but thanks to a new device called Tile, you may never lose anything else again. Tile can either be stuck to objects or affixed with a key ring and lets you track items you often misplace using a companion app for iOS. The slim and waterproof tracking device will show you the last known location of the item on a map as well as a radar style view of how far away you are from it, as long as you're within the 50-150 foot range. A tiny speaker inside each Tile emits a little beep, helping you zero-in for the find once you're close by, with a "warmer, warmer"-style direction to the object. One thing that sets this device apart from the many others on this list is that the Tile iPhone app works via crowd-sourcing. Tiles communicate with one another, effectively having other users help you find what you've lost. For example, when someone else who uses the app walks past your lost Tile-touting object, the location of your Tile is updated for you, which makes it far more invaluable than a device on its own, especially if it's been stolen. Price: You can pre-order from the Tile website for shipment after June for US$19.95 (about AU$21.58) per Tile, plus US$14 (about 15.14) shipping to Australia or New Zealand. Bluetooth is nice for pairing your phone with your car, but for finding your lost keys? If an item goes missing, the StickR TrackR alerts users via a Bluetooth connection to map your items within 100 feet, using the TrackR iOS and Android app. As long as you can stick or hang the coin-sized device on your item, StickR TrackR can locate it and track up to 10 lost items. The best part? You can make the misplaced item ring and use proximity detection to locate it. The StickR TrackR will remind you before you leave your phone behind for the day with a two-way separation alert. And just in case you don't hear the alert, the app will display a map where you left your valuable items. If you're ever out of range of your item, Crowd Source Tracking feature allows it to be found on your mobile device if another person using TrackR gets close to it. Price: The StickR TrackR costs US$24.95 (about AU$26.99), and there are no additional GPS fees after the initial cost aside from battery replacement, which lasts around six months. What if you could locate anyone, anywhere, at anytime? That's exactly what the Austrian company, Locca, is trying to do with its two separate versions of the Locca device; the LoccaMini for tracking objects like bikes and handbags and the LoccaPhone for tracking children and cars. 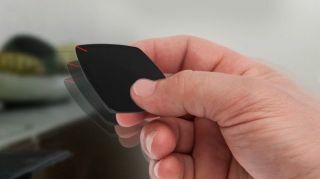 Unlike the other tracking devices we've covered so far, the Locca is equipped with a pre-installed SIM card inside its trackers and can monitor objects without needing your smartphone to be nearby. Once the tags are in place, users can consult the Locca mobile app to find out the location of each tracked object or person in real time. When an object moves away from a designated safety area, the LoccaMini alerts the user via a smartphone, tablet or computer, regardless of how far away they are (its service will initially cover the US, Canada and Europe and expand to more countries in late 2014). The LoccaPhone goes beyond simple tracking and has the added ability to perform two-way communication, which is perfect for children and the elderly. The device has an SOS feature that allows the wearer of the box to call an emergency contact of their choice simply by pressing a button. Price: LoccaMini packs prices range from US$135 to US$176 (which is about AU$146.04 to AU$190.39), including a charger, cases for each tag and a six-month service fee. The LoccaPhone is priced between US$203 and US$216 (about AU$219.60 to AU$233.67). Details available on the Locca website.